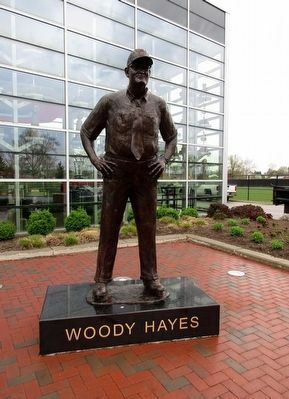 and colleagues, and which continues to guide the Ohio State community even today. Location. 40° 0.768′ N, 83° 1.39′ W. Marker is in Columbus, Ohio, in Franklin County. 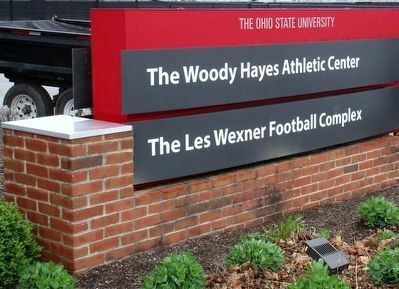 Marker is on Irving Schottenstein Dr, on the left when traveling north. Touch for map. 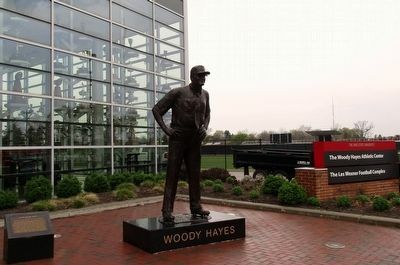 statue and plaque are at the east front parking lot of the Woody Hayes Athletic Center. Marker is at or near this postal address: 535 Irving Schottenstein Dr, Columbus OH 43210, United States of America. Touch for directions. Other nearby markers. At least 8 other markers are within walking distance of this marker. 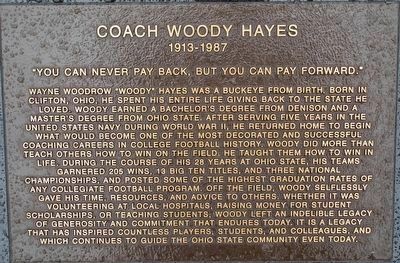 A different marker also named Coach Woody Hayes (about 500 feet away, measured in a direct line); Jesse Owens (approx. 0.3 miles away); The Jesse Owens Track (approx. 0.3 miles away); A. B. Graham and the 4-H Movement / Nationwide and Ohio Farm Bureau 4-H Center (approx. 0.4 miles away); The Lane Avenue Bridges (approx. 0.4 miles away); Freedom Brutus (approx. 0.6 miles away); General Curtis E. LeMay (approx. 0.6 miles away); Ohio Agricultural Experiment Station (approx. 0.9 miles away). Touch for a list and map of all markers in Columbus. Credits. This page was last revised on June 16, 2016. This page originally submitted on April 22, 2016, by Rev. Ronald Irick of West Liberty, Ohio. This page has been viewed 231 times since then and 11 times this year. Photos: 1, 2, 3, 4. submitted on April 22, 2016, by Rev. Ronald Irick of West Liberty, Ohio. • Bill Pfingsten was the editor who published this page.